Things to do on New Years Eve - Fun Ways to Celebrate with Kids! Things to do on New Years Eve – Fun Ways to Celebrate with Kids! 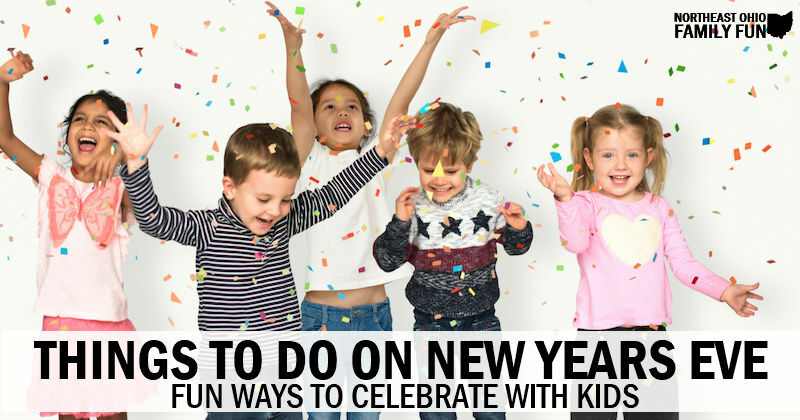 If you are looking for ways to celebrate New Year's Eve with your kids, we've got you covered. There are a lot of things to do on New Years Eve including many fun events taking place and ways that you can celebrate the holiday at home! Adventure outside or stay cuddled up indoors. Watch the ball drop at midnight or call it an early night. Get together with friends or stay home. Whatever you decide to do, we hope you have an unforgettable night! As usual, if you know of any fun events not listed, please submit the details here and we’ll get them added. Thanks for helping us all know about the best things to do on New Year Eve! Cost: $10/person (if purchased by 12/26), $12/ticket (after 12/26), little ones under age 2 are FREE. Purchase tickets here. Cost: All activities are included with Zoo admission. VIP experience also available. Cost: Included with general admission and FREE for members. Children in 6th grade and under and their families are invited to a celebration counting down to the New Year without staying up late! Enjoy stories, crafts, music, and dancing followed by a balloon drop at noon! Cost: Regular menu prices apply. The countdown to the New Year is on, and we all love a good celebration! Your New Year’s Eve may look a little different than it did before you welcomed children into the family. Whether you are planning on keeping your little ones up until midnight for an apple juice “cheers” or you would rather follow their normal bedtime routine, there are plenty of ways to make the day memorable. Recreate the midnight countdown, but just at noon so that you can put your kids to sleep at their normal bedtime. You can still go all out for the celebration, and they will never know the difference. Then you’ll have the night to either get to bed early yourself or stay up for the festivities. Plastic horns and confetti poppers are the perfect addition to any New Year’s celebration. There is just something about balloons that makes everything more fun. You can bet your kids will have a blast with this simple addition. You might want to hide the horns the next day, but you will have a blast in the moment. If you have children that are a little bit older, you can make your mission to last until midnight. So why not make the most of the countdown? Find some New Year’s themed treats to make, mix together a few mocktails or pull out the sparkling cider and get into your coziest pajamas. Then pick out a series that you have been wanting to watch together. The Harry Potter Series or a Disney Princess theme are sure to be a hit! Pull out the board games and a deck of cards. Then order in your favorite dish for the entire family. You can let everyone pick their most beloved game and alternate as you wait for the clock to strike midnight. Throw a batch of cookies in the oven for dessert and you are all set for a night of fun! You can turn on the ball drop and pause your games for the official countdown. It might be cold on New Year’s Eve, but that’s a perfect reason to get bundled up and get outside! Check out your local area’s winter activities. Ice skating, sledding or skiing would all be ideal ideas of fun for the entire family. Then, you have a great excuse to make hot chocolate and build a fire before the countdown later that night. Your little ones will be tuckered out from the day of activity and you will be ready for a night in. Hopefully these tips spark some ideas that fit your family’s plans and inspire a night that everyone can enjoy!